With the proliferation of the Internet, many users appreciated its advantages in the field of communication with people who live very far away, across the country or even the world. E-mail, ICQ, Skype – a convenient means of communication. And if the first two mainly supported text mode of communication, with Internet telephony you can use voice or even video communication, but to your caller hear you, the microphone. If you have a karaoke microphone, you can use it. Let's start with the fact that all modern laptops and netbooks have a built-in microphone, you only need to activate it in system settings. If it is broken, or you are facing challenges that require an external microphone, follow these steps. All laptops have a headphone Jack and microphone, to save space, they are often combined in a single nest, and switching is done automatically depending on the connected device. Look on your laptop a round hole, next to which is drawn the icon of the microphone or headphones and a microphone through the line. This connector is a standard socket 3.5 mm mini-Jack located on the side or on the back of the laptop case. Standard karaoke microphone has an output plug to a Jack, but unlike the entrance of a laptop, the size is not 3.5 mm and 6.3 mm. It more clearly, and without additional accessories to connect it will fail. To connect the device, you need an adapter with Jack for mini-Jack. It is a plastic or metallic cylinder, one end of which has a hole under Jack 6.3 mm and the other side ends with a plug mini-Jack 3.5 mm. Such adapters are sold in shops of radio components, audio equipment stores and some computer stores. After purchasing the adapter, you are ready to connect the microphone. The microphone plug insert into the socket of the adapter, the resulting bundle plug into the microphone Jack of the laptop. If your computer's operating system is Windows 7, after connection it will notify you of the connection device. Windows XP, when you connect, without displaying any notifications. After connection of a microphone and a laptop, you must ensure that the microphone input is active. Log in to the system mixer by double-clicking on the volume icon near the clock. In the field of microphone check whether the checkbox is "Off". If there is, remove and install the volume control to the required level. Also check the switch on the microphone, if necessary, place the switch in the "ON"position. You may encounter several different types of microphones. They differ in design and on the principle of converting sound vibrations. 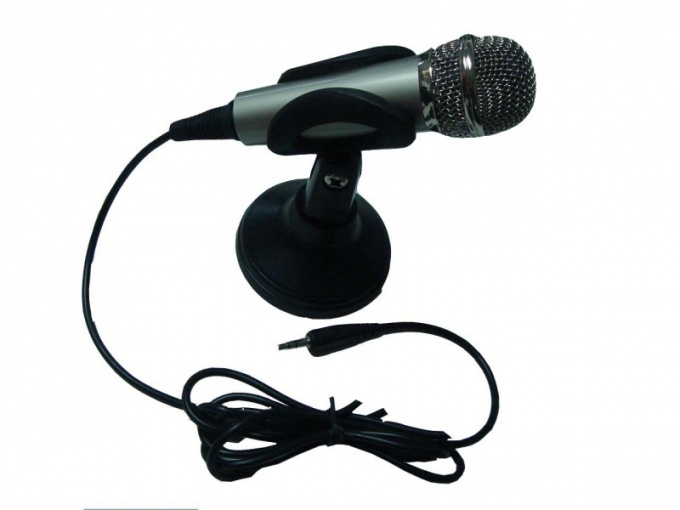 It is possible to allocate the electrodynamic and electrostatic microphones, as better. 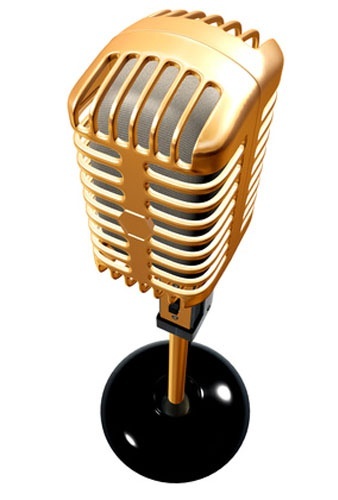 To electrodynamic microphones are reel-to-reel and tape, and electrostatic microphones condenser and electret is presented. If you are engaged in the equipment of the Studio, it is better to choose a condenser MIC, though he need an external power source. Do not attempt to connect a condenser microphone to the sound card. Keep in mind that using a condenser MIC, you'll have to take care of special matching device combined with a power source. All of the above elements are part of the mixer. To reduce the influence of acoustic noise attach the microphone stand or a stand with a special shock-absorbing suspension. Connect a dynamic microphone directly to MIC input on the sound card. The second way to reconnect using the line input of the sound card. Give is preferable to connect to the line input because you will get less noise. Use caution when connecting dynamic microphones to the mixer or microphone amplifier, which have a phantom power supply that provides the functionality of condenser microphones. Turn off the phantom power supply to avoid failure of dynamic microphone. If you have to connect a condenser microphone, use the microphone input of the mixer. Similarly you can connect a condenser microphone to a microphone amplifier having a source of phantom power. Check the connection between the outlet of the mixer or the output of the microphone amplifier and the line input of the sound card. If you have problems entailing interference caused by electromagnetic radiation, then connect the microphone to the mixer, applying a symmetrical switching. The signal from the microphone to the mixer will be transmitted through shielded twisted pair wires. Compare with the signal transmission from source to receiver single-core shielded cable. In a variant of the twisted pair of wires passing through a single wire, the signals are transmitted without changes. Such signals are also called "hot", "plus" or hot (+ve). On the other wire will be transmitted the same signal but in opposite phase. Such signals are called "cold", "negative" or cold (—ve). Any wire, even if it is shielded, at the same time functioning as an antenna, and consequently perceives interference, but at the input of the mixer will be a subtraction of the second signal and compensate for it. A mixer for combining audio signals in a single unit. Is necessary in the exercise recording when dubbing video files or record audio. Typically, other than the mixer used, and other expensive equipment. 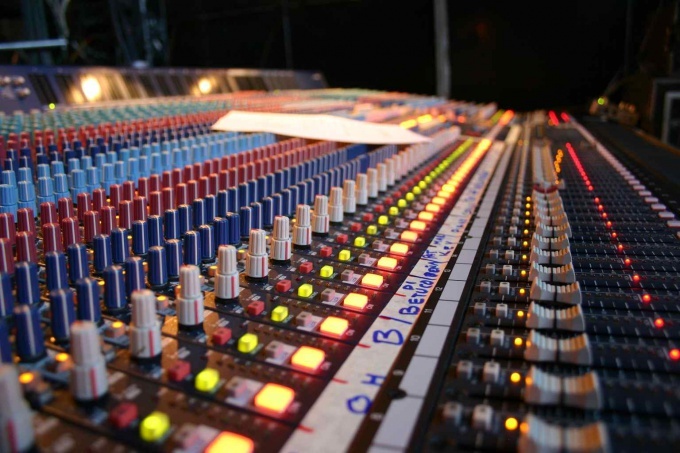 But if you have a mixing console and computer, you can connect and use as the recording system. To connect the mixer to the computer you need a mixer, a computer with a sound card having at least two channels of audio output, speaker system for audio output and connecting cables. If your PC is not installed sound card, contact a specialized center that you find appropriate accessories. As a rule, almost all sound cards have special inputs that let you connect the mixer to the computer. If you have a laptop, most likely, your sound card is already built inside. The connection cable depends on the capabilities of the sound card and the requirements of the mixer. Often need the following cables: single-channel a 3.5 Stereo-2RCA of not less than three pieces and cable 2RCA-2RCA to the music center. Carefully read the instructions for the mixer, not to be mistaken with recognizing all of the connectors on the panel. Connect one cable 3.5 Stereo-2RCA to the sound card, two cable LINE input CH1 and CH2. Connect the music centre by cable 2RCA-2RCA to the master output (on the record). Carefully review all the cables. They must be properly connected to the computer and mixer, to avoid any short circuits or anything. 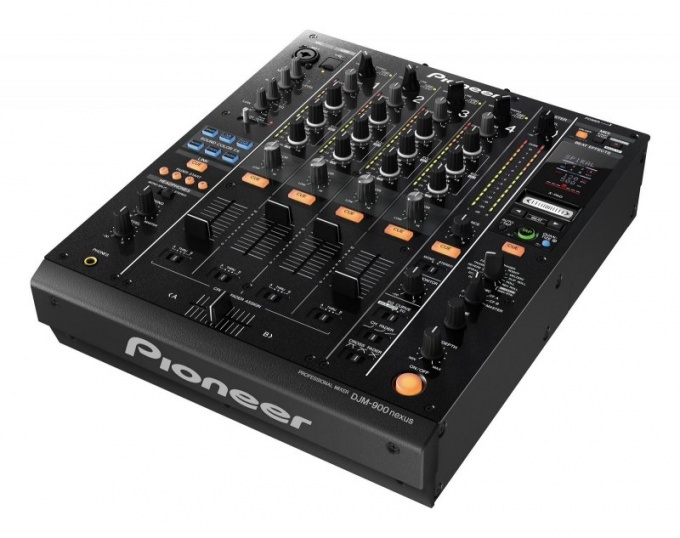 Configure the audio from the mixer to the computer after setting the program of signal processing of BPM Studio Native Instruments Traktor DJ Studio or PC DJ Red. Experiment with the settings for the sound devices to hear the output of the mixer. 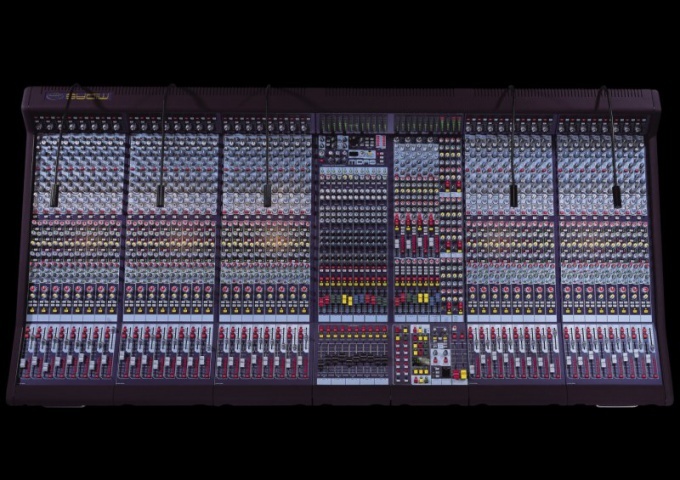 The exact algorithm of the connection depend on the specifications of the mixer and the capabilities of the sound card. Optimum use of the sound card that support 5.1 or two standard sound cards. Modern computers support different input and output sound. You can connect virtually any microphone for making calls, recording your own voice and its subsequent processing. For this you need to connect the device to the computer and make necessary settings. The microphone connection to the computer is performed using an appropriate socket on your sound card located inside the case. Any modern PC or laptop has two or three holes for mounting devices to work with audio. Usually sockets to connect speakers and microphones are located on the rear panel of the computer or on the side of the laptop. Also some desktop systems allow you to connect the device through the front panel of the computer, which in turn is connected with the sound card. 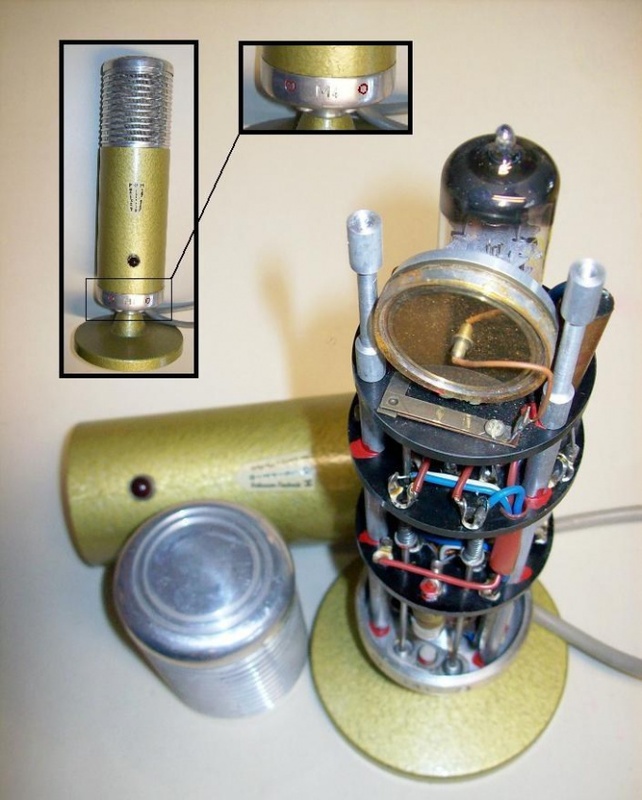 Connector for a microphone is usually colored in a pinkish hue, and on some panels the socket marked with a special icon. Insert the microphone plug into this connector. To verify the device after the installation of the plug into the socket, open the menu "Sound". To do this go to "start" - "control Panel" - "Hardware and sound" - "Sound". In the window that appears, select the "Recording" tab Is Microphone. Click "Properties". Go to the "Levels" and adjust the desired settings. To increase microphone volume move the slider to the "Microphone" to the right. To enhance the sound, you can also use the "microphone boost". To check the quality of the sound recording device, in the same window select the tab "Listen". Connect your speakers and headphones to the computer and check the section "listen to this device". Click "OK". Some modern computer microphones are connected to the USB connector. Insert the plug of the device into the computer and install the driver that is supposed to come with a microphone included. If there is no disc, download the drivers by going to the manufacturer website of your device and selecting the relevant section in the menu resource. If the microphone is not working, check the connection to the computer connector and read the cable device for damage.